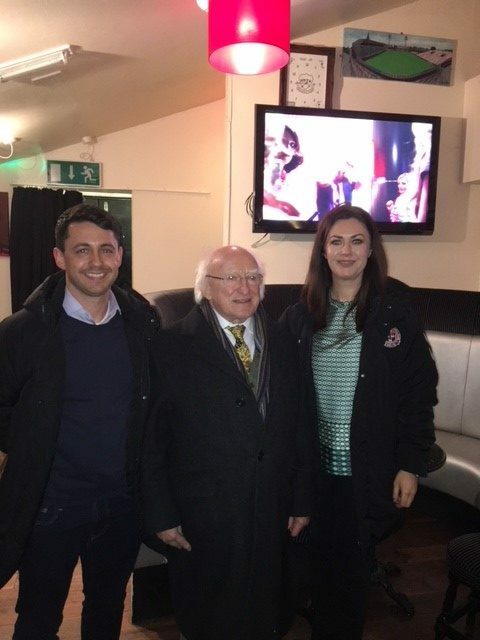 As an avid supporter of League of Ireland football, President Michael D. Higgins made the short journey from his nearby residence in the Phoenix Park to the home of Bohemian FC at Dalymount Park to attend the Dublin derby game between Bohemians and St. Patrick’s Athletic. During the visit, he met with staff from the Bohemian FC More than a Club Football Enterprise, Carina O’Brien and Shane Fox and was very interested to hear about the project and the work that the club are doing in the community. The “More than a Club” project aims to develop new social enterprises aligned with professional football clubs in Ireland and Wales which will design, develop and deliver innovative social programmes centered on health, education and social inclusion. The pilot project is supported by the Ireland Wales European Territorial Co-Operation programme, which is helping to strengthen collaboration between Ireland and Wales to address common economic and social challenges. Although Bohemians were on the wrong end of a 0-1 scoreline against their Dublin rivals, it was an exciting end to end game to enjoy for President Higgins, who regularly attends League of Ireland games when his busy schedule allows.